Wahama sophomore Emma Gibbs releases a shot attempt over a pair of South Gallia defenders during the first half of Monday night’s girls basketball contest at Gary Clark Court in Mason, W.Va.
South Gallia junior Jaslyn Bowers dribbles past Wahama defender Aleisia Barnitz (12) during the second half of Monday night’s girls basketball contest at Gary Clark Court in Mason, W.Va.
MASON, W.Va. — The difference a month makes … especially with a little change of scenery. 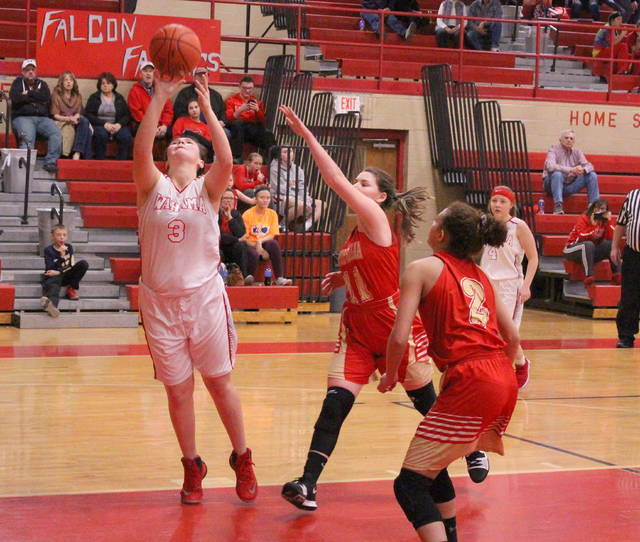 The Wahama girls basketball team led all but 2:22 of regulation and produced a season-high in points on Monday night with a 69-28 victory over visiting South Gallia in a Tri-Valley Conference Hocking Division contest at Gary Clark Court in Mason County. The Lady Rebels (6-14, 4-10 TVC Hocking) led all of 46 seconds in the contest as Christine Griffith notched the opening basket at the 7:22 mark, but the Lady Falcons (8-11, 6-9) countered with 11 consecutive points as part of a 17-2 surge to close the canto — providing the hosts with a 17-4 cushion through eight minutes of play. 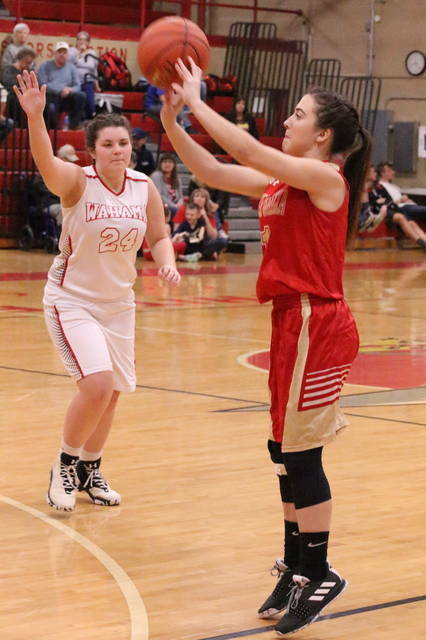 The Red and Gold were never closer as they went just 1-of-15 from the field in the second frame, and WHS made the most of that opportunity by using a 19-10 run to extend its lead out to 36-14 at the break. SGHS closed to within 20 points roughly 20 seconds into the second half, but the Red and White hit six of their first nine shot attempts as part of a 15-2 surge over the next five-plus minutes for a 51-18 contest with two minutes left in the third. Emma Gibbs tacked on a basket with six seconds left in the period, allowing the hosts to take a commanding 53-18 advantage into the finale. The Lady Rebels whittled the lead down to 31 points (55-24) with 6:49 left in regulation, but the hosts ended the game with a 14-4 run to complete the 41-point outcome. 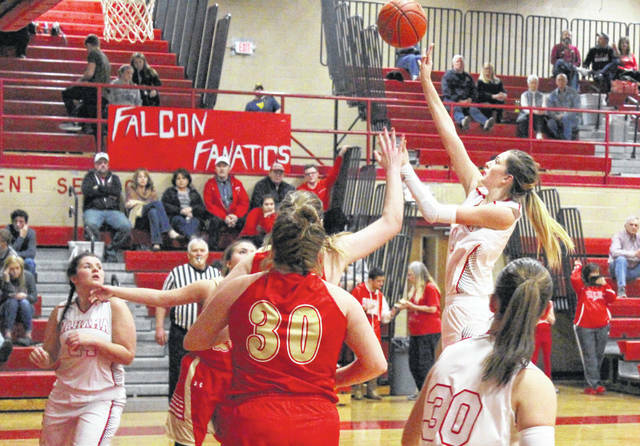 Wahama salvaged a season split in the head-to-head series after South Gallia claimed a 55-50 decision in Mercerville back on Jan. 3. 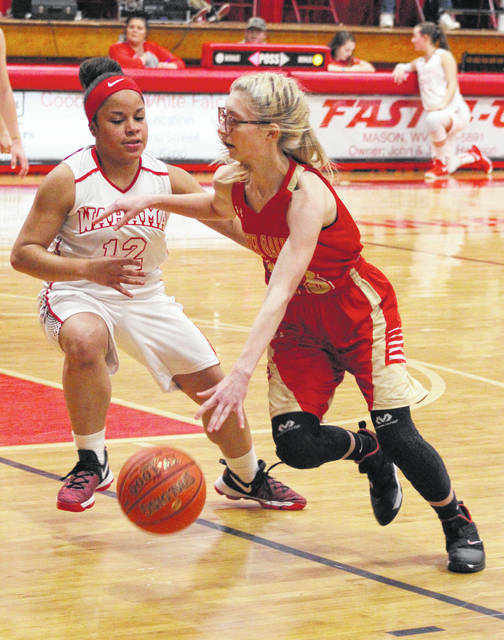 The Lady Falcons had 10 turnovers and limited South Gallia to just five field goals through three quarters of play, plus shot 56 percent from the floor after the break. The Lady Rebels — who trailed by as many as 43 points with under two minutes remaining — doubled their field goal total in the final stanza. Afterwards, WHS coach John Arnott noted that the end of a three-game skid all came down to working together as a unit … and he was pleased with effort that went into it. The Red and White tied the game at two at the 7:27 mark of the opening period on an Emma Gibbs basket, then Gibbs added the eventual go-ahead basket with 5:18 left. Those back-to-back goals sparked 11 straight points and eventually led to a 13-point edge after one quarter of work. Wahama led by as many as 24 points (36-12) in the first half and were up by as much as 35 points by the end of the third. The Lady Rebels were never closer than 31 points (55-24) the rest of the way. The Lady Falcons outrebounded the guests by a sizable 53-29 overall margin, including a 20-15 edge on the offensive glass. The hosts did finish the night with 17 turnovers, two more miscues than the Red and Gold. Wahama netted 30-of-64 field goal attempts for 47 percent, including a 1-of-7 effort from behind the arc for 14 percent. The Red and White also went 8-of-19 at the free throw line for 42 percent. Hannah Rose led WHS with a game-high 26 points, with 11 of those coming in the fourth quarter. Gibbs was next with a double-double effort of 23 points and 18 rebounds to go along with seven blocked shots. Harley Roush chipped in nine points and a dozen rebounds, while Torre VanMatre and Bailee Bumgarner respectively added six and four points. Lauren Noble completed the winning tally with one point to go along with 13 rebounds. The Lady Rebels made 10-of-65 shot attempts for 15 percent, including misses on nine of their trifecta attempts. The guests were also 8-of-14 at the charity stripe for 57 percent. Jessie Rutt paced the guests with eight points and Griffith followed with six points. Kiley Stapleton and Faith Poling were next with four markers apiece, while Amaya Howell and Makayla Waugh completed the scoring with three points each. Griffith led South Gallia with eight rebounds, followed by Waugh and Poling with five and four caroms respectively. Wahama returns to action Thursday when it travels to Waterford for a TVC Hocking contest at approximately 7 p.m.
South Gallia hosts Eastern on Wednesday and welcomes Trimble on Thursday in a pair of TVC Hocking matchups at 6 p.m.